For Tips and Cheer Alerts: Add a Tip Alert widget, and under its Properties, set the conditional Min. Amount (at least more than 0), then personalize the rest of the widget as much as you like. 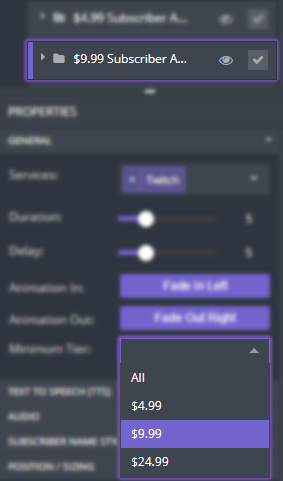 Add more Tip Alert widgets with different minimum amounts to get more varied alerts onto your stream. For Subscriber Alerts: Add three extra Subscriber Alert widgets ($4.99, $9.99, and $24.99), and after setting the Minimum Tier for each tier, personalize each widget as much as you like. For Re-Subscribers: Add a Re-Subscriber Alert widget, and under its Properties, set the Minimum Month, and then feel free to personalize the rest of your widget as much as you like.